Eliminating wires and connections in a modern solid state system is the most powerful way to increase system reliability. Opteon devices are rugged and compact enough to be located anywhere in your system. Any mix of sensors, communication, logic, or lighting can be included in any device in the system. Metadata is the key to perfect determinism. 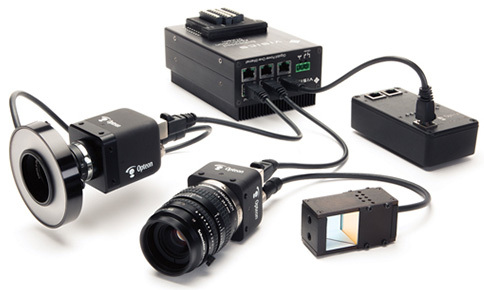 Opteon systems include application specific data, generated in real time by your machine, that is unique to each part to be inspected, as a component of the image data. The operation of Opteon Maestro® system coordinators is completely deterministic no matter how many combinations of input conditions must be continually tested simultaneously. The Composer utility allows very rapid development of SCORE language programs composed of straightforward natural language descriptions of even the most complicated, parallel, asynchronous, high speed systems. The result is safe, reliable, real time, race-free operation. Systems composed of Opteon devices interoperate just as effortlessly with Programmable Logic Controllers from all of the major suppliers. Any system data detected by the Opteon system can be communicated to the internal memory of the PLC in its native language at the PLC’s maximum rate. Any information communicated from the PLC to the Opteon gateway is available to all Opteon devices in 1 µS.